Bryana Hopkins handles the ball. The sophomore forward’s efforts were crucial in the Wildcats’ victory Sunday. Last year as a freshman, Bryana Hopkins played 26 minutes all season. Now, she averages 22 per game, bolstered by a 39-minute, 12-point performance in Sunday’s win over Rutgers at Beardsley Gym. 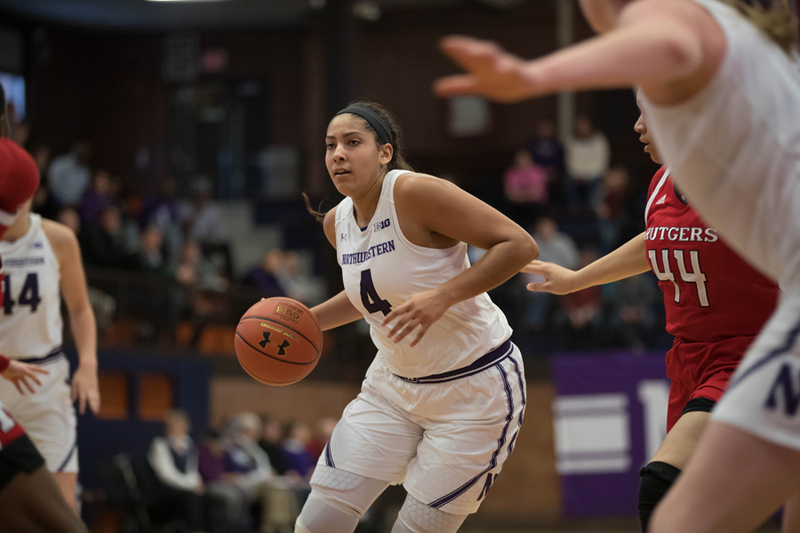 The sophomore forward got it done on both ends of the court for Northwestern (11-19, 4-12 Big Ten), racking up four steals, two assists and seven rebounds along with her 12 points. Hopkins’ new central role in the team has come thanks to injury — senior guard Lydia Rohde has missed the past 14 games — and circumstance, with Amber Jamison stepping away from the team for personal reasons. At times Hopkins has struggled, but against the Scarlet Knights, she thrived. She finished above her season average in almost every statistical category — she scored 12 points for the third-highest total of her career, shot 3-for-5 from the field and 6-for-7 at the free throw line and was a key part of the team’s defense effort that limited the visitors to 34 percent shooting from the field. Against Rutgers, her main defensive assignment was guard Tyler Scaife, the fifth-highest scoring player in the Big Ten. Scaife led the Scarlet Knights with 17 points, but it took her 21 shots to get there. Hopkins was able to bother Scaife with her quickness and length, and also defended without fouling too often. The visitors attempted only seven free throws on the day, with Scaife accounting for zero of those seven attempts. Recently, McKeown has even started moving Hopkins into the point guard role. At 6-foot 2-inches tall Hopkins is taller than the Wildcats’ listed starting guards, Jordan Hamilton and Lindsey Pulliam, but she’s proven herself to be a somewhat reliable ball-handler recently. That versatility has been crucial for NU, and McKeown said it makes preparing to face the Cats harder for opponents. “When you watch tape, if you’re scouting Northwestern, you’re like, ‘This kid plays every position,’” McKeown said. NU faces a monumental task next week — winning five games in five days at the Big Ten Tournament if it hopes to keep its season going — and Hopkins will undoubtedly play a crucial role in that effort.